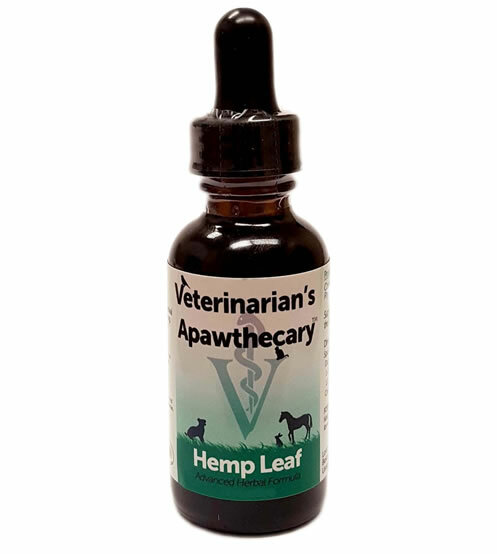 Hemp Leaf Tincture for dogs and cats supports healthy modulation of the endocannabinoid system. This formula is a highly palatable liquid extract that is rich with naturally occurring phytocannabinoids. Hemp Leaf is a proprietary formula containing freeze-dried whole hemp leaf juice. Hemp Leaf for dogs and cats supports healthy modulation of the endocannabinoid system. This formula is a highly palatable liquid extract that is rich with naturally occurring phytocannabinoids. My wife and I are retired. We have a 2 year old cat named Sammy. One of us is always home so he craves attention and affection...and receives it. Our daughter gave birth to our first grandchild in July. We have spent a lot of time away from home. The cat now suffers from separation anxiety. He began chewing the fur from his fore legs...both sides. I've tried homeopathic creams and they help for a short time. But all they do is address the symptoms. The skin is clear where he chews. No redness or bleeding. Still, he must be a nervous wreck. After only a week of using the tincture twice a day, we've noticed a big change in his anxiety. He has nearly stopped the chewing of his own fur. He is calmer. He is relaxed. I had no idea how really upset he was as a result of our absence due to the babysitting. Now we are seeing a different cat. The fur is growing back. I don't see him chewing. Our vet wanted us to spend over $600 on allergy testing and injections. The other option was to put him on Prozac. No way would I allow either. The Hemp Leaf Tincture has been a godsend and I believe we are seeing the light at the end of the tunnel now. What an amazing turnaround for Sammy. I will never be without this hemp leaf oil in my medicine cabinet. My German Shepherd is terrified of fireworks and very stressed when guest come over. This product changed everything, she was completely relaxed on this amazing herb. When I gave it to her she would bite down on the dropper and not let go. I had to start giving it to her in her food bowl. She also has arthritis and I have been supplementing her with several products and she is more playful and seems happier. I would give 10 stars if that was an option. This product has worked miracles on my baby fur boy Minion&his seizures! Started giving this product to my golden retriever that has epilepsy and arthritis. Due to the long use of powerful meds his kidneys have been affected. I opted to try this as I didn't want to give him anymore pills and he turned around. He started eating again, more spry and much happier. I will keep using this as an alternative to all those ridiculous medications which also cost a fortune!! Great product!! Our 2 year old cat Willie is/was a chewer. Socks, sheets, towels, etc. Anything left out was fair game. A couple of weeks after starting a daily dosage he has stopped the habit. It hasn't changed his active personality but it has helped his anxiety. *Certified by independent analysis to contain less than .3% tetrahydrocannabinol in compliance of federal law. This product is non-psychotropic. Formulated and manufactured in the USA. Squirt directly into mouth or add to food. 1-2 times daily.